Lagos has its origins in a fishermen village and with the discoveries during the 15th century it became an important naval center, so its history has always been linked to the sea. The city has some of the best beaches in Portugal. Meia Praia, the sandy Dona Ana and Camilo offer to visitors the perfect conditions for a big variety of water sports practice in its wide bay. 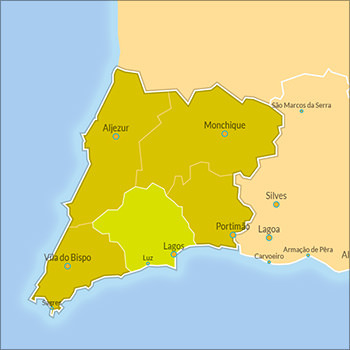 The council is divided in 6 main parishes: Barão de São João, Bensafrim, Luz, Odiáxere, Santa Maria (Lagos) and São Sebastião (Lagos). The city is just about 1h drive from Faro International Airport (FAO), and like most cities in the Algarve it's best to walk around, so find a place to park your car and enjoy the city. This page is only a brief overview. If you want to know more detailed travel information about this city, we recommend you take a look at our Lagos Portugal Guide website.